I have been working on a comparison of the Lodestar ccd guide camera with the new CMOS-based QHY5L-ii video camera, and here are some initial results. For context, I am interested in sensitive guide cameras that can operate at video rates, and in the past I have used Sony ccd video cameras (lumenera) for guiding. I purchased the Lodestar some time ago and did some initial measurements of its sensitivity and didn't find it dramatically different from my Lumenera, so I was never motivated to use it. When I heard this new CMOS chip was sensitive, I was very skeptical because I had heard the same thing about an earlier CMOS chip, the MTM9001, and I was not impressed by it, compared to the Lumenera ccd. But my initial tests with the QHY5L-ii suggested it really was sensitive despite its small pixels, so I set out to compare its performance with Lodestar since Lodestar is considered a very sensitive guide camera. Comparing the two cameras is challenging mainly because the effective pixel sizes are very different. The Lodestar cannot download a full image in a single pass at full resolution, and instead requires two passes at two different times. I don't think this is practical in a guiding context, so I only studied the Lodestar in binned mode, where each pixel is effectively 16.4x16.8 microns in size. This is 20x the area of the 3.75x3.75 um pixels of the qhy. So I wanted to make a systematic measurement of the fundamental camera properties in different wavelength bands, rather than just image stars in the sky and make qualitative comparisons. I set up the following system, which combines hardware and software for systematically exposing the cameras under identical condtions to well defined pulses of filtered light. The goal was to measure the gain and read noise carefully, and then estimate relative sensitivity in different wavelength bands. The setup is shown below. 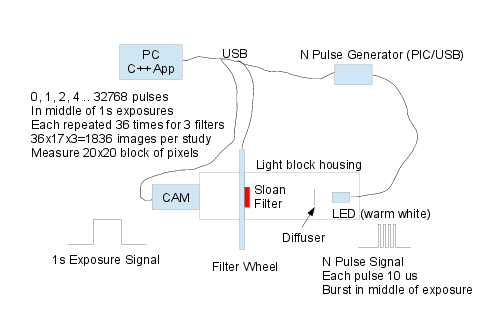 As shown in the schematic, I don't rely on exposure timing to control the amount of light, but instead keep all exposures the same, at 1 second, and flash the camera with diffused light through a filter in discrete, counted pulses. I don't know how many photons are in each pulse, but I have good control over the changing number - through powers of 2 in the applied pulses. Normally people measure gain and read noise with just a pair of bias images and a pair of flats, but partly motivated by Janesick's approach using "Photon Transfer Curves" or PTC, I show noise vs. mean ADU in each exposure - on a log-log plot. In this case I do it slightly differently because I study each pixel in a 20x20 block, and with 36 exposures at each pulse count, I can measure the noise and mean adu for each pixel - rather than rely on the behavior of the whole block. A raw view of the result is below. In the above plot, each point corresponds to the signal and noise at a particular pixel with a particular number of light pulses applied to it. The horizontal axis corresponds to the increasing light received, and on a log plot the steps are uniform - as expected since the number of pulses doubles in each step. This plot shows a flat region on the left corresponding to low light, read noise limited data, and on the right is a linear region with slope 1/2 corresponding to shot or Poisson noise limited data, due to the random nature of the photon arrival process. By doing a model fit to the curve I can estimate the gain and read noise accurately - and this tells me how many electrons are in each image. Since I know how many light pulses were applied, I can find the number of electrons per light pulse, per pixel, for each camera. 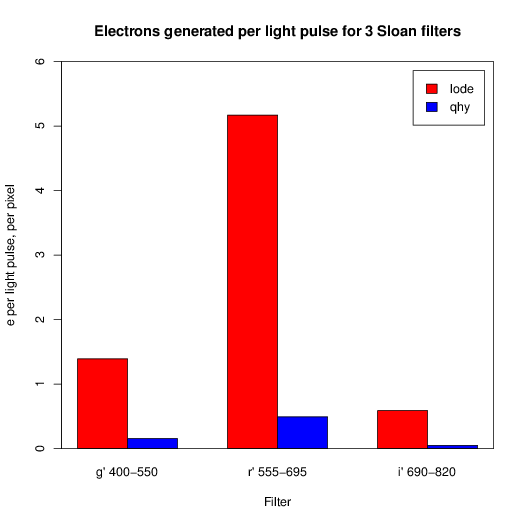 The following plot shows the calculated number of electrons per light pulse for the Lodestar with a Sloan g' filter. As you can see above, the estimate is very noisy at low pulse count because so few photons arrive, but at higher count the result is very consistent. This tells me in an absolute way how the pixels respond to a given illumination - and I can then do the same for both cameras with the same setup and get a relative measure of sensitivity based on generated electrons per light pulse. A raw comparison of the two cameras, for each of three filter bands, and per pixel (ignoring differences in pixel size) is below. At this point I should say that the light source is a warm white LED and is definitely not uniform in its output spectrum - but I don't think that matters much here because I am studying in well defined spectral regions defined by Astrodon g', r', i' Sloan filters with sharp cutoffs. All I need is some amount of light emitted in each band, to allow me to make measurements, and the result should be fairly meaningful for comparison in each band. But I cannot make any statement about sensitivity in the g' band vs. r' band - because I don't know the photon count. 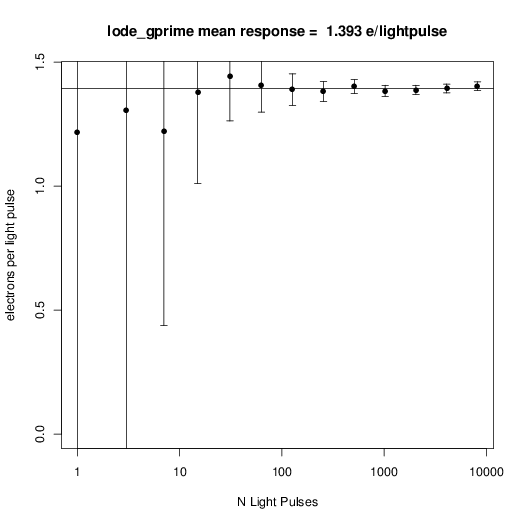 But I can compare the r' sensitivity of Lodestar to the r' sensitivity of qhy with some confidence. Here is the result on a pixel basis. 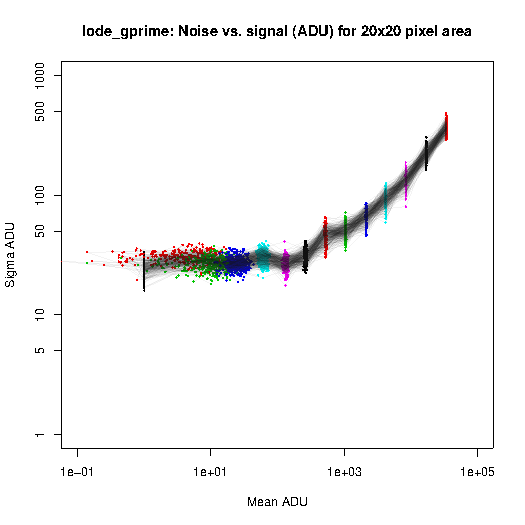 The above plot makes things look pretty bad for the qhy - but note that pixel size is not taken into consideration - and the Lodestar pixels have 20x the area. 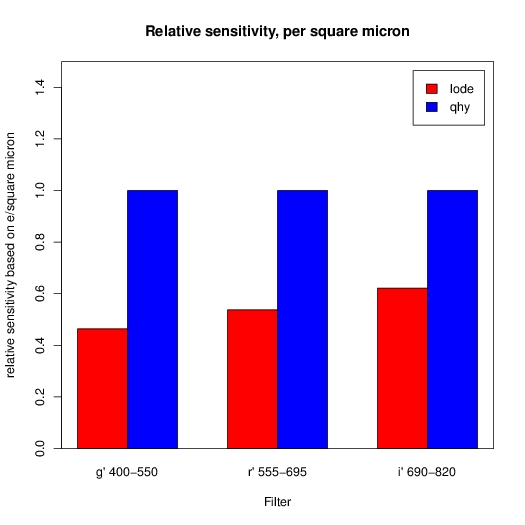 If we factor in the area and determine the relative sensitivity on a per square micron basis, we get the following plot. From the above plot we can see that on a per area basis, the qhy is much more sensitive, and more arriving photons will be converted to electrons that register as signal. And this is true in each band, including toward the IR, where I thought Lodestar would win. But what about read noise? Read noise is harder to compare because it is inherently per pixel and can't be converted to an intrinsic measure like e/square-micron. In short, the read noise of the binned lodestar is around 10e, and the read noise for the qhy is around 6.5e. So - on a per pixel basis, the read noise of the qhy is less than lodestar. But if you aggregated all the pixels in the qhy to the size of the Lodstar binned pixel, the read noise would increase by sqrt(20) - or about 29e. So on that basis, the read noise is much worse in the qhy. But does this really matter? This is where comparing the cameras is difficult, because the qhy has an inherent win in terms of both sensitivity and resolution - which is important if the star spots are very small - but may not be important if the star spots are big. Furthermore, if the star is bright then read noise doesn't matter anyway - and the sensitivity is what matters. One way to view it is to think of the qhy with a small 50mm f/4 guidescope. The star spot will span some number of pixels on the qhy. If you replace the qhy with the lodestar, you would need to increase the f/ratio in order for the star spot to span the same number of pixels. The total arriving photons would be the same, and the number of pixels involved would be the same - at which point all that matters is the sensitivity, and the read noise per pixel - which both favor the qhy. In summary, the qhy does appear to be more intrinsically sensitive than the lodestar in the 3 spectral bands - and the read noise per pixel is also lower. I have used the QHY for video guiding with MetaGuide using OAG on an 8" f/10 sct and find it works well and is very sensitive - and I prefer it to the Lumenera, which has 7.4um pixels. There was a fair amount of work involved in this study and I could well have made a mistake - but the quantitative result is consistent with my qualitative impression when using it under the skies. Questions, comments, corrections welcome - especially any comparison data since I have nothing to compare this result to. Frankly, I don't understand what is relative sensitivity (per area basis) and why it should be relevant? It shows that the qhy converts more of the arriving photons into signal than the lodestar. The whole point of large aperture and a sensitive detector is to convert as many photons as possible into signal - so yes it is pretty important. Does this mean that you will have to bin the QHY in order to actually benefit from the higher per area QE of the QHY? I did not realize that you had to bin the Lodestar. I use an Atik Titan for guiding and I download a full images each time as far as I know. I would have thought the Loadstar would be the same. But I also would wonder whether the smaller pixels with the smaller pixel scale would not be a problem. I guess that in some ways the smaller scale could work in your favor. It would show a movement sooner and if it can work on dim stars then it should work OK. Interesting data, thanks for posting it. No - not at all. All you have to do is place the sensor at the focus, and the more sensitive one will record more arriving photons than the less sensitive one. There will be more read noise - but that may not matter much for a guiding application if the pixels for the star have enough counts. I think the smaller pixels would be an advantage for guiding with a small guidescope, where the star spot is better sampled *and* more photons are used for the centroid. At the same time, I use the qhy for video guiding with MetaGuide and OAG, and the sensitivity allows detection and accurate centroids of faint guidestars at video rates. Note that you can't really bin cmos detectors because they don't do the movement of the charge like a ccd does. The cmos sensor in the qhy has what I would call "firmware binning" because the sensor can bin the image, but it does it in the same way as software binning and just adds up the signal from 4 adjacent pixels. When doing that the read noise doubles and the signal quadruples - but it is no different from software binning except it reduces the data bandwidth sent over usb. My version of the qhy software doesn't support binning yet but I think it will happen. My understanding of the Lodestar is that you would have to do two successive exposures, each full length, if you want full resolution. I don't know if anyone guides this way and I think the standard way to guide with lodestar is to bin - which means you are measuring the centroid of a star spot with fairly huge pixels. These huge pixels are why people feel it is so sensitive - but I think it is largely just due to their greater area. It isn't trivial to estimate the impact of pixel size on guiding error, but I think the current attitudes of "1/30 pixel centroid accuracy" overstate the true accuracy of centroid algorithms when guiding on a short exposure guidestar image. I prefer the star spot to be well sampled for an accurate centroid that can be guided on tightly. As an aside - I'm not using any 3rd party software in talking to the cameras, but going directly to the drivers via their sdk. The sdk for the lodestar does not allow a single high-res capture mode without binning. If people use 3rd party software like maxim to expose cameras, they need to be careful that the exposure requested is consistent and matches the actual exposure. In my case all exposures are 1 second so the timing and camera behavior are exactly the same - which helps guarantee consistent data for the exposures. Yes, but how can that be? It is my understanding that (feel free to correct me) QE is always given for single pixel and determines percentage of photons converted to electrons. So, QE is more or less the same for Lodestar and QHY5-II (maybe little higher for QHY) but Lodestar has much bigger pixels 8.2x8.4 um vs 3.75x3.75 for QHY. That means that much more photons are hitting single pixel of Lodestar sensor (pixel area is 4.9x bigger) which results in faster saturation of Lodestar pixels and therefore higher sensitivity. How is possible that Lodestar has much higher sensitivity per pixel but QHY has higher sensitivity per area? I find your results contradictory. Of course, I'm not an expert, my knowledge of the subject is limited so fell free to correct me. The QE is an inherent property of the detection system and is independent of the pixel size. If the QE is 50% and you have a big pixel, you could have 1000 photons arriving and they would generate 500 electrons. For a small pixel with the same QE, you could have 10 photons arriving and 5 electrons generated. The small pixel generates 5 electrons vs. 500 for the large pixel - both exposed to the same light source - and both have QE=50%. The smaller pixel receives fewer photons, so it generates fewer electrons. If you had a bunch of the small pixels equaling the size of the large pixel - the sum of the electrons would be equal for the same total pixel area. In this case, the QE of the qhy is higher than that of the lodestar - so more of the incoming photons will be converted to electron signal - independent of the pixel size. And that's a good thing. We are in agreement, QE is given for single pixel. So, aren't you then actually binning QHY? QE is a property of the detector system and it doesn't matter if you base it on a single pixel, 10, or the entire sensor. It is the ratio of photons detected to photons arriving. It is a unitless fraction and doesn't need to specify "per pixel." I am not "binning" anything - but just summing. You add up the total number of electrons generated by one pixel or a thousand - and you divide by the number of photons that arrived - and that unitless fraction is the QE. If the pixel structure is uniform, like with a solar cell, you could even look at a tiny section of the pixel and measure the QE based on that. It is an intrinsic property of the detection system and need not be thought of "per pixel." This is a side issue in this discussion and I don't want it to detract from the main point - that the QE is higher for the qhy, so it will convert more of the photons in a given star spot into electron signal despite having smaller pixels. OK, QE is a property of the detector system, I got it. And, since QHY has slightly higher QE than Lodestar it will convert more photons into electrons per area. But what about saturation? Wouldn't Lodestar saturate faster because of larger pixels? I didn't go into measurements of the full well depth, but as expected it appears to be smaller for the qhy. The two main uses of the qhy are for guiding (since it has an st4 port) and for planetary imaging - and neither one really needs a deep well since in both cases you are using short exposures to capture faint detail. Guiding is based on sensitivity and measuring the centroid of faint stars, while planetary work involves fairly uniformly lit objects and video that gets stacked with many frames. If you do photometry or deep sky imaging, where stars tend to saturate in long exposures, the well depth matters - but I don't see it as very important for guiding or planetary work. For the qhy you can set the gain value so that saturation either does or does not happen in the given bit depth. I used gain=40 in this study and the pixels clip before they saturate. For gain=10 you would see saturation happen before clipping. Also - the QE isn't "slightly" higher - it is almost twice as high in the visible, and still wins by a fair amount in the IR - based on my measurements. If others can confirm this result or provide additional supporting evidence that would be good. But it is not a small difference, particularly with the read noise per pixel also lower for the qhy. Thanks, I think I understand now. Frank, thanks for posting the study and results. Very interesting. Your experimental setup looks pretty good in isolating the making the specific measurements of QE. I would like to do a PTC characterization of my camera's some day and this setup seems like a good way to collect the data. Frank, thanks for the comparison between the QHY and Lodestar guide cameras. I'm just now trying OAG and my SSAG has a hard time finding stars. SSAG works, but I have to move around a bit to find a good star. What would help me: Sample images from each camera, such as when pointed at an area of the sky with few bright stars. I have a hard time translating the technical specs into reality. The QHY5 is very inexpensive. I might give it a try and see if I get better results than with my Lodestar. That's right. Lodestar is more sensitive and that's all what it matters as long sampling is good enough. No need to split hairs. Lodestar will deliver better results. ...In this case, the QE of the qhy is higher than that of the lodestar - so more of the incoming photons will be converted to electron signal - independent of the pixel size. And that's a good thing. Thanks for the detailed report Frank. Now I know why this cam works so well. I opted for the QHY5L-IImono. Five factors were part of my decision over the Loadstar. 3. Video or single shot options. 4. Much more robust ST4 connector. I have used it successfully for guiding with the MetaGuide in video mode (thanks for that BTW) and MaximDL in single shot mode. For me it is a more flexible cam than the Lodestar and at a lower price.